Kenya is a highly photogenic country. The main point of interest for most photographers is the prodigious wildlife that inhabits the national parks and other reserves. Landscapes are greenest in the wet season, and the sky is least hazy then too, but this can be a difficult time to travel as game drives and other activities are washed out by frequent storms. For dedicated photographers, there are several advantages to staying in private concessions or reserves such as those on the Laikipia Plateau and bordering the Masai Mara. These private reserves are relatively costly to visit, but they tend to have better and more sympathetic guides, and the ability to drive off-road, combined with the lack of other tourist traffic, means you can stick longer with a good photographic subject, and usually get far closer to it, and line up better. Wildlife photography requires faster and higher-magnification lenses than most other subjects. The ideal lens combination would be a zoom that goes up to 300 together with a fixed 400, with a fastest f-stop of 4, or better 2.8. Bring a beanbag upon which to rest your lens to minimise the risk of camera shake; to save weight you can carry it empty to Kenya and fill up with rice, beans or a similar instance after you arrive. Colourful traditional ethnic groups such as the Maasai, Samburu and Turkana make for great subjects, but it is important to ask permission before photographing them. Many people will refuse, while others will expect to be paid. 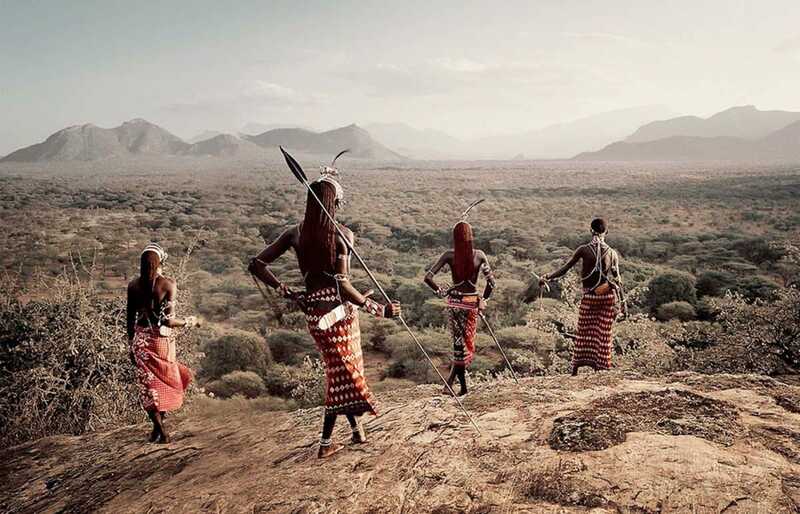 A good option for photographing traditionally-attired people is to arrange a paid visit to a traditional village bordering the Maasai Mara or Samburu-Buffalo Springs. The Swahili people of the coast are also sensitive about being photographed, in particular the women, whose Islamic culture perceives it to be immodest.